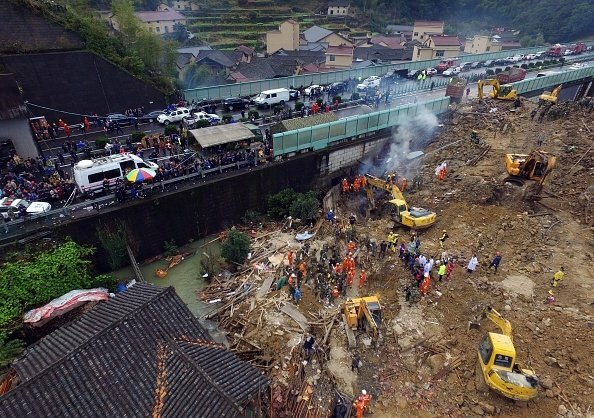 At least 25 people are confirmed dead after a landslide hit Zhejiang province in eastern China. More than 2,000 rescuers are searching for survivors in Lidong village after several days of rain sparked a torrent of mud and rock. The landslide occurred shortly before 23:00 on November 13 and buried almost 30 houses. Parts of the village remain flooded, hindering rescue efforts. Reports say 12 people are still missing. Local officials said one person had been rescued so far and is in stable condition. As well as rescuers, sniffer dogs and machinery, psychologists have also been dispatched to the area to help family members of the victims, local officials said. Most of the missing people are children and the elderly, according to local media, which also said that compensation had been agreed for those who lost homes in the disaster.